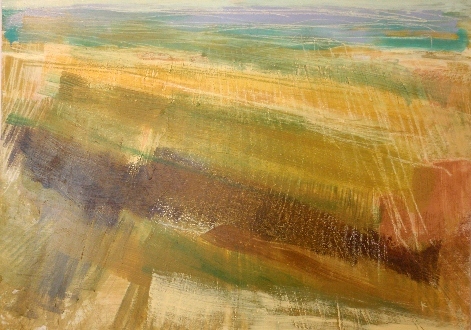 ‘Pfalz landscape‘ Acrylic and Pastel, 2010, 140 x 100cm. During my stay in Speyer most of my work has been based on the city’s fine cathedral. As a landscape painter though, I felt it important that I try and paint at least one typical Pfalz landscape. This new painting is based on the view from the edge of the hills, overlooking the vineyards and out over the Rhein plain to the hills of the Black Forest beyond. The painting is quite an abstract composition, but its scale lends itself well, I think, to this big, open view.